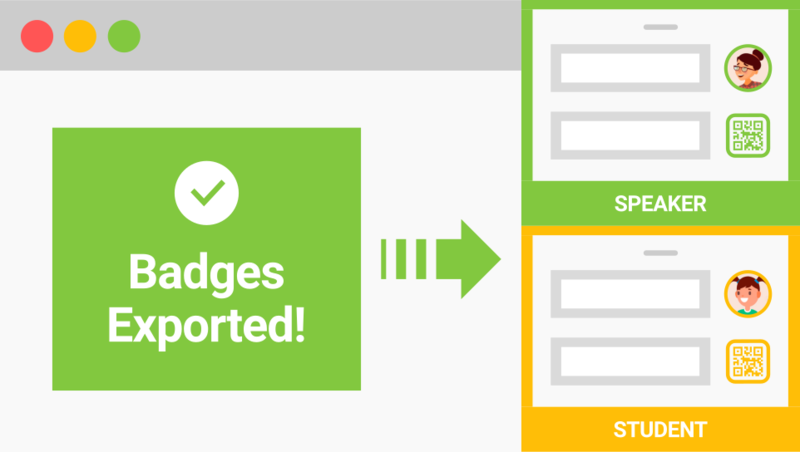 Pull attendee data to create beautiful, custom and interactive badges that help with games, check-in, and lead gen.
With PheedLoop, badges are more than pieces of paper. They're designed to create data-driven and interactive experiences for everyone. Event staff can scan badges to track attendance for the event as a whole, or even individual sessions. 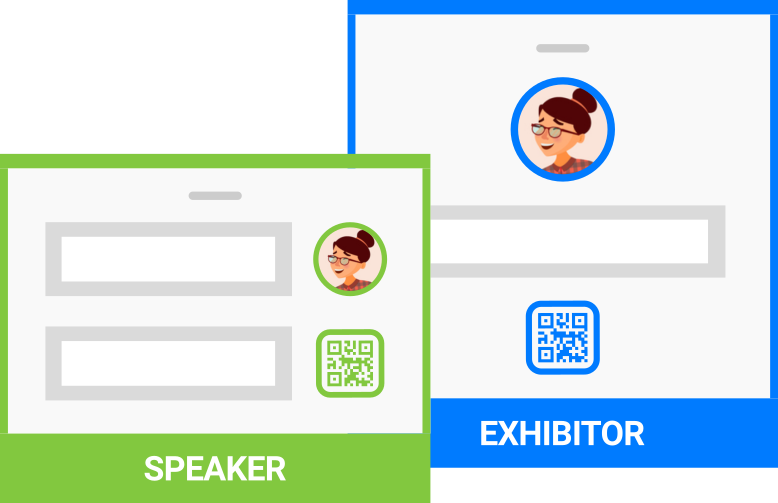 Exhibitors can scan badges to capture leads, and attendees can use them to network! PheedLoop makes badge management super simple with its default 3 x 4 inch designs which capture your event's graphics and colors. But if you want to get creative, the sky is the limit! You have complete control over the design, dimensions, and colors of your badges, and Team PheedLoop is always happy to help you create awesome designs. Every event planner has an approach to badge management that fits their style. Some like to have badges pre-printed, others like to run the presses on-site, and some do both. With PheedLoop, you can bulk print badges in standard formats, or sync printing with check-in. Choose whatever works best for you! What do your badges look like? By default, PheedLoop exports standard 3" x 4" badges with your banner and theme color. But you can modify the template to match your size, design and content requirements. What details are included on badges? By default, the attendee's full name, title, organization, and any tags (e.g. speaker, exhibitor, student, etc.). 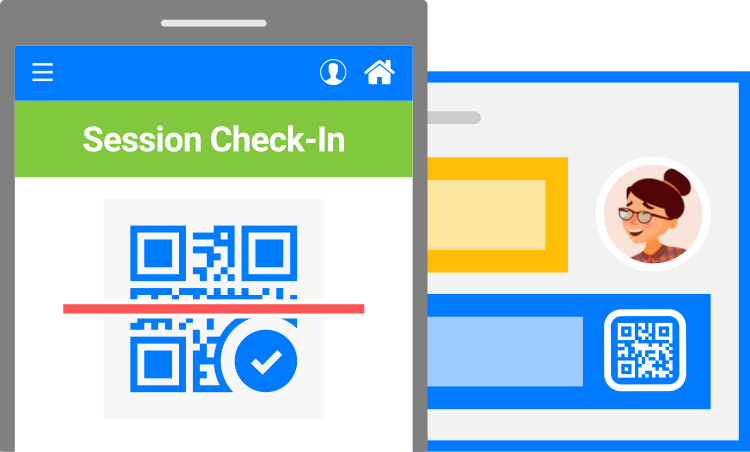 A QR code is also embedded to aid with check-in and interactivity. What exactly do the QR codes do? 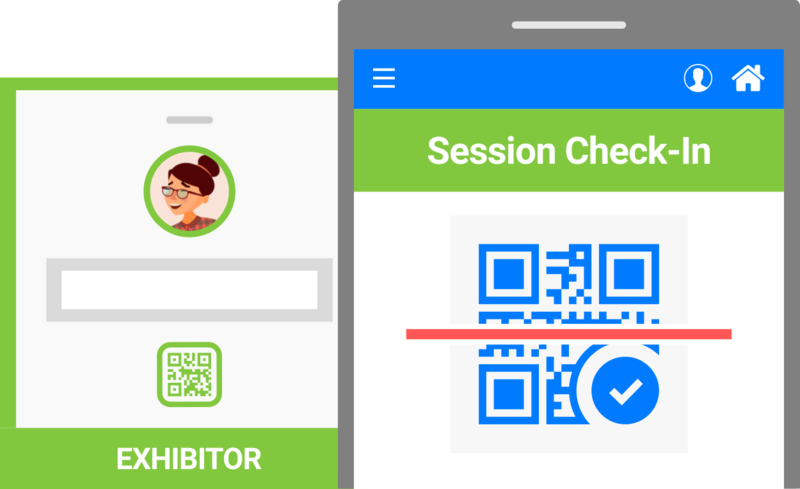 PheedLoop's event app has a built-in QR code scanner, used by event staff to check attendees in/out of the event and sessions, exhibitors to capture leads, and attendees to network. Can I export multiple badges at once? Absolutely! If you're going with the 3" x 4" badges, you can export singles or sheets of 6 which print perfectly on standard 6 badge sheets - great for pre-printing badges. Which printers is PheedLoop compatible with? It really depends on the size of badge you choose to create, and we'd be happy to offer suggestions. For 3" x 4" badges, the Canon PM-400 and Dymo printers are great possibilities. Does PheedLoop help with badge design? You bet! Our designers on-staff are always extremely delighted to lend ideas, design expertise, and direct help every step of the way. We want your event to look amazing. Do you also print and ship badges? Yes, we have several global partners which PheedLoop interfaces with to produce and ship any type of badge you like. We'd be happy to suggest options when you're ready. How does on-site badge printing work? You can use your admin dashboard to check attendees in as they visit your event, and when doing so you'll be prompted to optionally print their badge. It's that simple!